Transparent tae translucent, uisually green, less eften colourless, yellae, blue tae violet, pink, broun. Blue stanes – strang, blue an yellae tae colourless. Ither colours are waik tae very waik. Yellae stanes – purpish-pink, which is stranger in lang wave; blue stanes – blue tae licht-blue in baith lang an short wave; green stanes – greenish-yellae, which is stranger in lang wave; violet stanes – greenish-yellae in lang wave, licht-purpie in short wave. 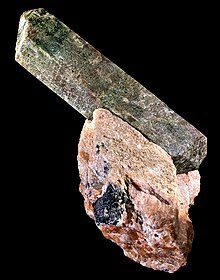 Apatite is a group o phosphate minerals, uisually referrin tae hydroxylapatite, fluorapatite an chlorapatite, wi heich concentrations o OH−, F− an Cl− ions, respectively, in the creestal. This page wis last eeditit on 14 Februar 2018, at 07:40.